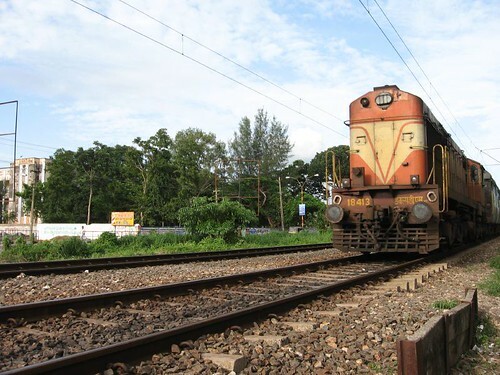 Here’s a video from an afternoon of rail-fanning at my hometown – Kollam, Kerala, India. The train is none other than the 2626 New Delhi-Trivandrum Kerala Express hauled by new WAP4 on the block – 22694. The 2626 is my fav train! This rail-fanning spot is just opposite the SN College, Kollam next to the Kollam Junction Railway Station. You can hear me and my best buddy pass inane comments while ogling at the train. The best thing about this video was the group of travellers singing ‘Laila 0 Laila’. Enjoy! Minutes later, the Kochuveli-Bangalore Express, hauled by a WDM2 passed by. Couldn’t take more snaps than this as the train passed just a few inches from where were sitting… 🙂 But it was such a scary but exhilarating feeling! yes, ok but the speed of the train is not noticed,as it is superfast express ,the shot would have been taken from the way at which it was in full speed….